Return a clone of this decay mode with pd as the decaying particle. Get a pointer to the particle data object corresponding to the decaying particle. The set of identified decay products. The set of identified decay products in the order they were specified. The set of identified resonance products with specified decay modes. The set of matchers each corresponding to one decay product. The pointer to a matcher corresponding to any number of decay products. The set particles corresponding to excluded intermediate resonances. Return the branching ratio to be used. Calculate the branching ratio for a particular particle instance. Get the decayer assigned to this mode. Check if another decay mode is included in this one. Return a pointer to the corresponding decaymode for the antiparticle decay. Check if another decay mode has the same final state as this one. Return the list of overlapping decay modes. Modify this mode to have properties corresponding to its anti-partner. Check whether this decay mode is switched on. Set a pointer to the particle data object corresponding to the decaying particle. Set the branching ratio to be used. Switch on this decay mode. Switch off this decay mode. Add identified resonant product with specified decay mode. Add a mathcer corresponding to one decay product. Add a matcher corresponding to any number of decay products. Add a particle corresponding to an excluded intermediate resonance. The set of identified resonant products with specified decay modes. Set the pointer to the corresponding decaymode for the antiparticle decay. Check sanity of the object during the setup phase. Protected creation and clone methods. Add a decay mode to the list of overlapping modes if included. Remove all decay modes from the list of overlapping modes. Check if two sets of particles have equivalent types. Check if a particle set contains a given particle ID. Use the members in this decay channel and generate the corresponding tag. Delete the tag (it will be regenerated later if asked for). Utility function for the interface. True if this mode is switched on. Pointer to a particle data object corresponding to the decaying particle. The set of specified decay particles. The set of specified decay particles in the order they was specified. The set of matching decay channels corresponding to a specified with a specified subsequent decay mode. A particle matcher which corresponds to zero or more particles. A set of particles which are not allowed as intermediate resonances. A list of decay modes which are included in this one. The decayer object responsible for performing the decay. The corresponding decay mode of the anti particle. The DecayMode class describes a decay channel of a particle. In its simplest form it contains simply a parent ParticleData object and a list of decay products, but it can also specify a set of MatcherBase objects each representing one of a set of possible decay products. A matcher can also be specified to represents an unlimited set of decay products. Decay chains can be represented by specifying other decay channels where the parents are taken to be intermediate resonances. It is also possible to specify the absence of intermediate resonances. an exclamation mark followed by a path to a particle in the Repository or a PDG-standardized particle name representing the exclusion of an intermediate resonance decaying into the other specified decay products. two paths to particles in the Repository or PDG-standardized particle names with an equal sign between, indicating two coloured particles which are in a colour-singlet state. Note that the order of the specified decay products will be preserved when the corresponding particles are produced in a decay. The possibility of specifying matchers as decay products means that one decay mode may overlap with another one. When an EventGenerator is initialized all decay modes are checked so that a given decay mode afterwards will report if there are other modes which are matched by its matchers through the overlap() function. The interfaces defined for DecayMode. Definition at line 87 of file DecayMode.h. A vector of pairs of ParticleData pointers. Definition at line 105 of file DecayMode.h. 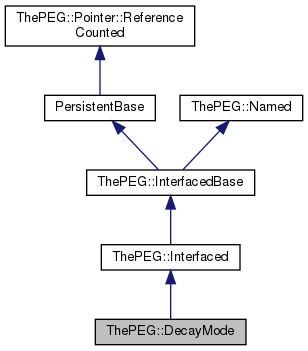 A vector of DecayMode pointers. Definition at line 103 of file DecayMode.h. Add a pair of decay products which are linked together (e.g. a pointer to the new object. Create a decay mode from a given tag. This function is used directly by the Repository. If name of the decaying particle is a valid path to a particle object, the decaymode will be added to that particle, otherwise it will be added to the default particle of that name. The set method returns false if the decayer does not claim to be able to handle the decay. Return a vector of pairs of decay products which are linked together (e.g. Definition at line 236 of file DecayMode.h. Produce particles corresponding to the identified decay products. They will be orderd in the same order they were sspecified. Read setup info from a standard stream used by the Repository. The following information must be supplied in a white-space separated list: the branching ratio, on or off (true or false), and the name of a Decayer. Return the tag for this decay mode. This string is a unique identifier for this decay mode. Definition at line 148 of file DecayMode.h. The EventGenerator is a friend. Definition at line 98 of file DecayMode.h. Definition at line 92 of file DecayMode.h. Definition at line 95 of file DecayMode.h. The vector of pairs of decay products which are linked together (e.g. Definition at line 568 of file DecayMode.h. The set of matching decay products. Each of the matchers correspond to one particle. Definition at line 536 of file DecayMode.h.